John Oliver experienced the high of forgiving medical debt. You can, too! 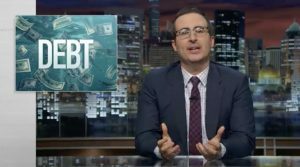 The Last Week Tonight with John Oliver show on debt-buying brought laughs and needed attention to a major U.S. social issue: The seemingly never-ending cycle of medical debt collections and its effects on our people. Oliver and his staff located and purchased the debt and then donated it to us, so we could forgive it. Our charity, RIP MedicalDebt, was brought into existence specifically to do just that, forgive medical debt, and provide relief to the poor or ill that are in hardship. Our donors stand with us to send the message to those hurt that although we might not be able to cure the pain, we can certainly keep the bill collector from the door. Few people realize that most bankruptcies are caused by out-of-pocket medical expenses, and millions more use up their life savings as a consequence of unplanned and unforeseen medical events. Unbelievably, there are more medical bankrupts each year than yearly graduates from college. “Being insured” is not a salvation. More than 70 percent of those that go bankrupt from medical debt had health insurance. Under “Obamacare,” for now, almost 20 million Americans now have healthcare insurance that previously did not. However, according to Commonwealth Fund surveys, move than 30 more million are still underinsured., adding to more than 60 million people underinsured or totally uninsured. That’s too many. How many people do you personally know who went bankrupt this past year, or even the last four years, as a result of unpayable medical debt? You won’t know about it from them, as the guilt and stigma of having somehow “failed” keeps this personal horror out of polite conversations, even among relatives and family members. This lack of awareness is the problem. Here are the hard realities. A recent Federal Reserve Board survey, cited in The Atlantic, stated that nearly half of Americans would have trouble finding $400 to pay for an emergency. A person making a gross income of less than two times the federal poverty level (below about $22,000 for a single person) may only have enough money available on a weekly basis to pay for food, shelter and clothing, let alone medical expenses. Research shows that those going bankrupt spend only about $25-50 per month more than they earned, but the debt was too hard to bear on their own. Our medical debt forgiveness process begins with an unpaid bill to a doctor or healthcare provider, donor (RIP’s “social investor”) and a patient debtor owing the bill. Often in our world, that bill can be months or even years old, and may have been handed off from bill collector to bill collector. This is no longer a patient-doctor relationship; it is creditor-debtor relationship. We don’t have to tell you that this dynamic hardly leads to a happy ending. Our role and philosophy is to break this chain of pain. We step in between the hospital and the debt buyer, or between the debt seller and the collection agency. We offer to meet the same purchase price for that medical debt. However, we make an unusual promise: We will not pursue collecting the debt. We will abolish it, forgive it, take it off the debt market forever. We forgive medical debt because, like each of our donor/investors, we feel compassion deep in our gut. We can now do something to free another person in poverty or hardship from a destructive medical debt cycle. Its a private, random act of kindness. No judgment, no pity, just a gift to a stranger, looking for nothing in return. Health Advocacy reviews Ashton and Goff book: The Patient, The Doctor and The Bill Collector.